In every organization there will be a time when one of the crucial processes breaks down and a major issue is created. The client or senior management are expecting answers and usually they don’t have a lot of patience. Your team is responsible so you need to get the work back on track. As a manager you are the coach and not the best player on the team, so act as a coach, don’t judge but encourage. Ensure you keep wondering why; who was it who said ” a sign of intellect is that you keep wondering, only idiots are certain about everything in their life”. Ask solution based questions, not problem based questions. Broader open questions will trigger more substance than multiple choice. Many managers feel frustrated when issues occur in the department and targets are not being met. The way you handle the situation can have a major impact on the outcomes. The wrong way to go about it would be like in this Dilbert cartoon! Good questions trigger some thought process in the other party that may help them structure their thoughts or go over all items they may have missed once again. One first step would be to accept that the problem is there. Asking why the problem is there will waste lots of time with explanations that won’t solve the problem but just rehash the situation. You want to make progress and get the issue resolved, so ask questions that will help to accomplish that. One of my kids was in a school production. One of the classmates was operating the light console and clearly not understanding what needed to be done to put all actors in the right lights. Instead of asking: “Don’t you know how this thing works?? ?” which would have wrecked the self esteem and not provided any solution, or asking “Can’t you read the manual (that was right on top of the console)? ?” which would have made the classmate feel stupid, I asked “How can we figure out how this thing works?”. The response came immediately (smart kid) “uhh from the manual”, and my suggestion “do you know where the manual is?”. Anyway, long story short the classmate took the manual, felt smart about solving this crisis and took it home to study it for “the big day”. 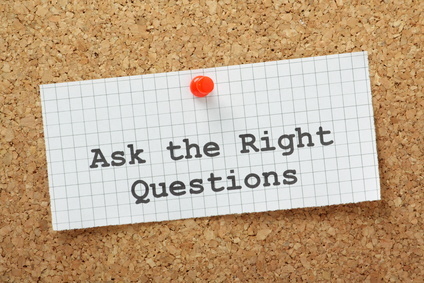 Asking solution oriented questions will point in the right direction but should not contain your version of the answer. So don’t ask “should we not read the manual?” but rather ask “where can we find that information”. Because you never know that the one handling the problem may have a ton of other sources to figure out the information. In the example above the classmate could have pulled out a laptop and google the issue, or tell me to get one of the school’s staff members who may have provided the answer. Your smartly veiled suggestions in the form of questions are not the best way to go about solving the issue. Even if you know the solution and can solve the issue right there and then, depending on the urgency of the situation, there is value in having your employees find the solution themselves. Assume competency, assume positive intend, focus on what needs to be done and not on what has gone wrong. There is a place for finding out why things have gone wrong to re-look at the process and improve it but that time is not when you are working to solve the crisis. It takes a different mindset to move away from the familiar focusing on the problem and starting to focus on the solutions. The solution based approach found it’s origin in psycho therapy but now has a solid place in the best practices for organizational interventions.